Within the 9.7" LED-backlit touchscreen, the 2048 x 1536 native resolution renders text and images at 264 pixels per inch and a total of over 3.1 million pixels. The display also features an oleophobic coating, which helps reduce the amount of fingerprint smudges. The f/2.4 rear camera has an 8-megapixel sensor that captures images at a native resolution of 3264 x 2448 and 1080p HD video. The camera also features time-lapse video, exposure control, 120 fps slo-mo, a burst mode, a timer mode, and a high-resolution panorama mode. The 1.2-megapixel front-facing FaceTime HD camera can record 720p video and has an f/2.2 aperture that lets in more light. Its sensor and pixels help improve performance in low-light conditions, while dual microphones employ noise-reduction technology to help suppress background noise. In addition, when you switch cameras from front to back (or vice versa), the microphones switch too, so what your iPad sees is what it hears. Use your unique fingerprint as a password. Touch ID lets you unlock your iPad instantly and secure private data in apps. 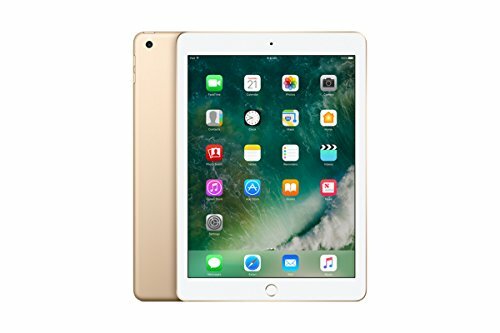 Thanks to two 2.4 GHz and 5 GHz antennas and MIMO (multiple-input multiple-output) technology, the iPad can reach download speeds of up to 866 Mbps with its 802.11ac connection. So now when you want to download a movie, share photos or documents with AirDrop, or just browse the web, your connection is even faster than before. At just one pound and 7.5mm thin, the iPad is designed to go wherever you go. And it's as durable as it is portable, with an aluminum unibody construction that delivers a solid feel. iOS 10 is Apple's secure mobile operating system. You can work and play using two apps at once, ask Siri to send a message for you, and automatically back up your files with iCloud (Access Anywhere).